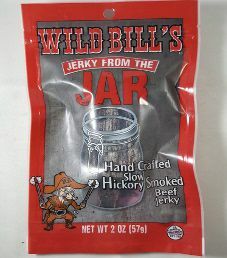 This will be the second review for Wild Bill’s hickory smoked Jerky From The Jar style of beef jerky, which refers to a mason jar. 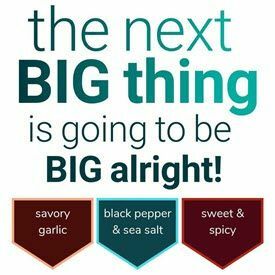 The jerky weight has since been reduced, the price increased, the bag design has been tweaked, and the ingredient list may have changed. 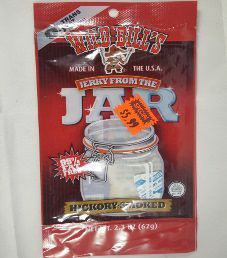 This 2 ounce/57 gram bag was purchased at a gas bar convenience store in Sayre, Pennsylvania. 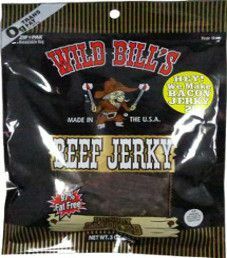 The next review for Wild Bill’s will be on a 3 ounce/85 gram bag of their teriyaki beef jerky. This flavor is described as being sweet, savory, and packed full of rich flavor in every bite. The bag was purchased at a gas bar convenience store in Sayre, Pennsylvania. 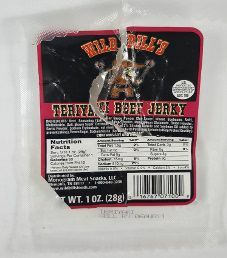 Note: For a live taste review on a newer ingredient list, open up Wild Bill’s – Teriyaki Beef Jerky (Recipe #2) written by Stéphane Leclerc. 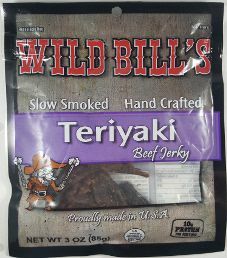 The next review for Wild Bill’s will focus on a 1 ounce/28 gram bag of their teriyaki beef jerky. This bag was purchased at a grocery store in Penn Yan, New York, in the summer of 2010.